Don’t get stuck comparing Apples-to-Oranges. Our roofing inspection clearly explain straight-forward options to repair, replace, or extend the life of your existing flat roof. Contact us today at 775-831-4188 to request your Free Roofing Inspection and Evaluation! 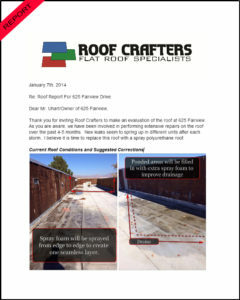 Free Roof Evaluation Contact Us!